SAN DIEGO, CA. It had come to that day. 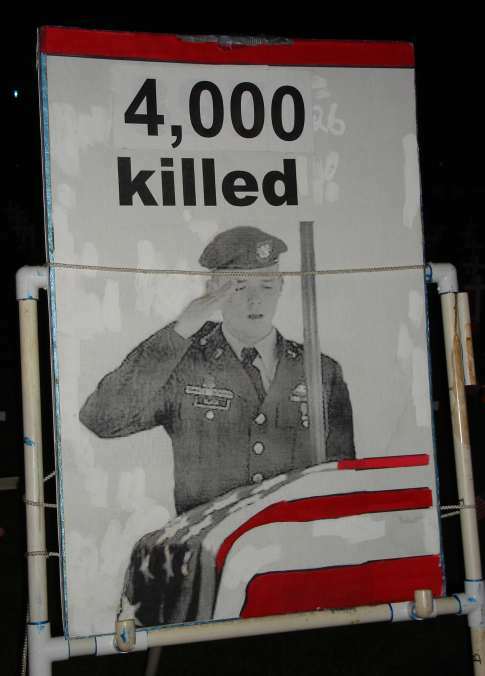 The day when American military deaths in Iraq reached 4,000. Peace activists had planned the vigil weeks in advance, for they knew this day had to come. The administration in Washington has been saying for months that the deaths of our countrymen and women has slowed, since “the Surge.” But the day of 4,000 had to come. And it came on Sunday, March 23rd, 2008. Some say the Surge has caused another thousand American deaths, as that’s how many we’ve lost since the Surge. 4,000 since the first day of the invasion. 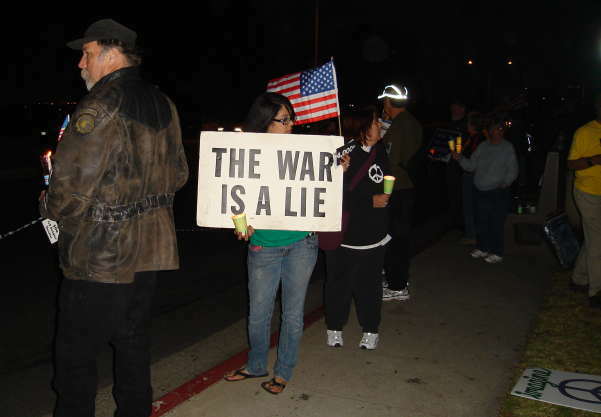 Nearly 150 San Diegans came out for the vigil – to commemorate the 4,000, to be witness to the event, to show their statements in signs and banners and flags along Park Avenue to the passing motorists, to each other, to the sparse mainstream media that covered the event. 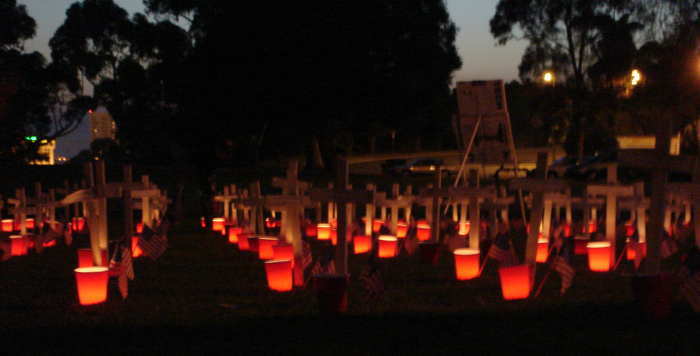 Vets for Peace organized it; they planted 400 crosses with lit candles – 400, each representing 10. For the last ten days, San Diegans have been participating in the national series of demonstrations marking the fifth anniversary of the Iraqi invasion and occupation. 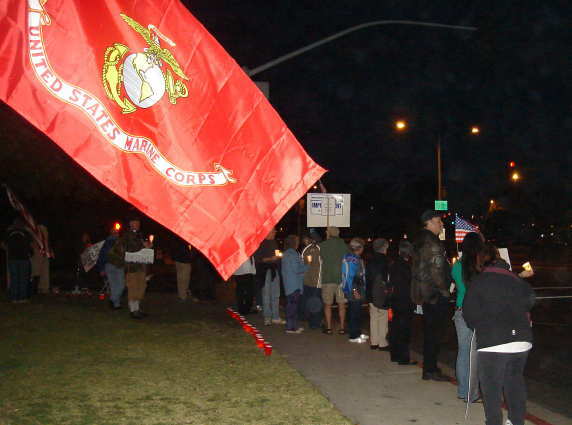 It started Friday the 14th with Vets for Peace down at the Midway, was punctuated by the major march and rally in City Heights on the 15th, with Wednesday the 19th’s candle vigil in Balboa Park, and the Die-In on Saturday downtown. It is simply an historic moment – coincidental – that the 5th anniversary and the 4,000th death came at the same time, a mere 4 days apart. … Or is it. You have taken some beautiful photos of last night’s event. Last night as we were driving home from the Candlelight vigil described above, my husband and I were discussing the turnout. Although 150 people is a good turn out for an event like this in SD, it is sad that for a city this size most people seem to stay at home. Perhaps some are out of touch about the reality of war and others are following President Bush’s instructions – they spend their time at the mall. Five years is a long time. 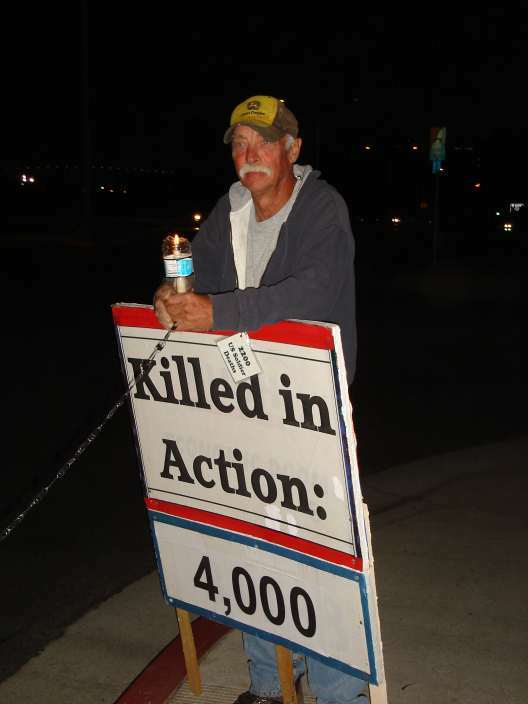 4,000 young Americans are dead along with over a million Iraqis. Patriotism requires participation and participation requires an informed citizenry. Perhaps if we try harder we can help the slackers who snicker and play at the back of the classroom with their homework . Then maybe we will see informed public debate replace frantic flag waving.